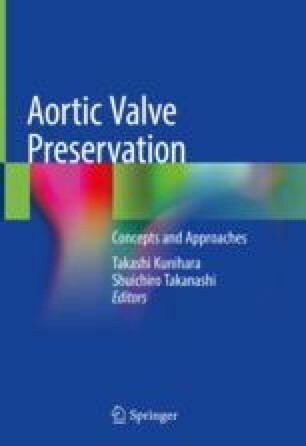 It is true that the absolute number of patients who have undergone surgical treatment on an anatomical aortic valve in childhood is not as high as that in adults. However, in recent years, treatments for the aortic valve have certainly advanced, and their number has increased even in children. Furthermore, if we consider the issue from the perspective of surgical treatment on a “systemic outflow tract valve”, the absolute number is dramatically increasing. In addition, most of the patients who require intervention for systemic outflow tract valves in childhood may become candidates for late re-operation. The re-operative procedures can be more complex than expected for common adult cardiac surgeries because they have not yet gained experience in the conventional treatment of acquired aortic valve disorders. Considering such factors, in the twenty-first century, it seems very important that both pediatric and adult cardiac surgeons learn treatment strategies for patients with congenital heart disease affecting systemic outflow tract valves.